We know what a letdown it can be when you buy a brand new pair of scrub uniforms from Uniform Advantage, only to have them be covered in stains after the first day you wear them in your office or hospital. We compiled this scrub stain remover guide, to help you find all natural stain fighters that will help combat common stains you come across working as a medical professional. From sweat stains, to pen ink, or baby vomit, we’ve got your back (and your front) covered with easy stain removal solutions. Hopefully these common items can be found at your house after you get home from work, or possibly even at your place of employment if you get time to treat those medical uniforms stains on the spot! Happy scrubbing! 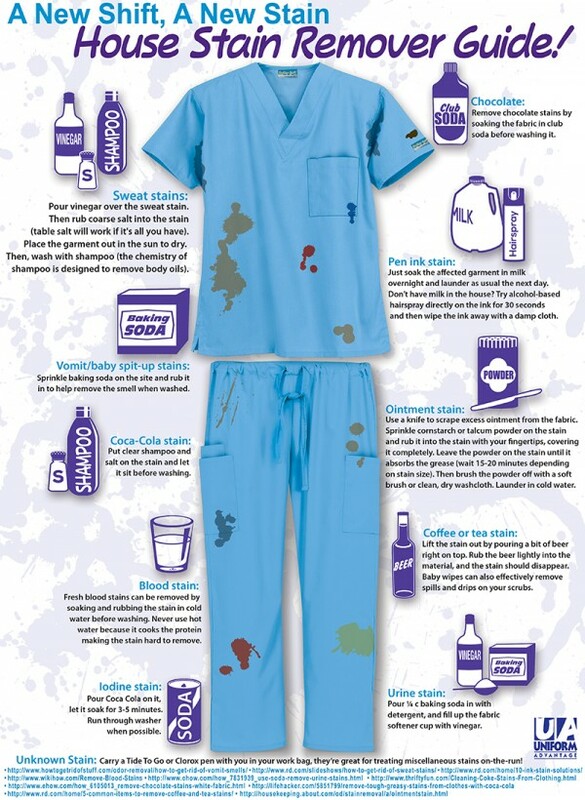 Nice design of the actual scrub uniform with the different stains all over to help illustrate how to remove them. The information is helpful and provides enough instructions for readers to try these stain removal tips at home.